Nairobi — To avoid mistakes witnessed during the Westgate terror attack, Kenya's security forces systematically approached the scene of Tuesday attack on 14 Riverside Drive. Three teams drawn from the General Service Unit elite Recce squad took the lead in an effort to take control of the situation that left several people with injuries. Other armed teams, both in civilian and police uniform were seen carefully evacuating hundreds of people who were caught in the incident. "Breath in, breath in... " they would tell the visibly frightened survivors. 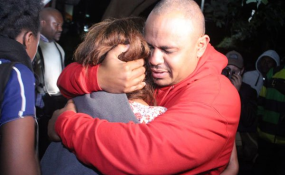 It's believed that some of the Westgate attackers disguised themselves and left with the people but in this case, police carefully took down details of those rescued before guiding them to a secluded corner for counselling and processing. Four choppers, armoured vehicles and hundreds of armed police officers took strategic positions to ensure they got the situation under control. It's an attack that comes on the third anniversary since hundreds of Kenya Defence Forces soldiers were killed during an attack by the militants at their El Adde camp in Somalia. It's also some six years after the Westgate terror attack that left 67 people dead. Nairobi, East Africa's largest city is a victim of tens of terror attacks by the Al-Qaeda linked Al-Shabaab militants. Detectives drawn from the DCI based bomb squad have since detonated explosives found in one of the vehicles parked on the road leading to the complex. By 6.30pm, this reporter could still hear gunshots from the complex.